It was already late afternoon at Chauk Htat Gyi temple. 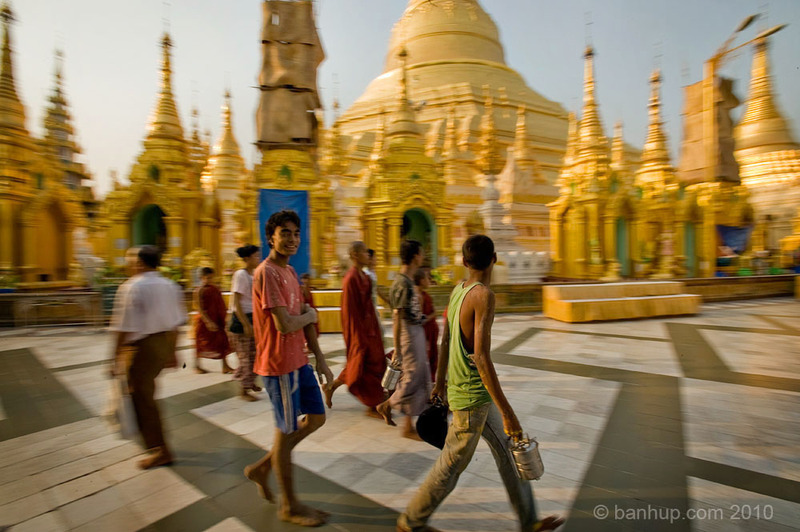 With sunset looming off we went to Shwedagon Paya to witness its famed golden pagoda and how it changes at sunset. 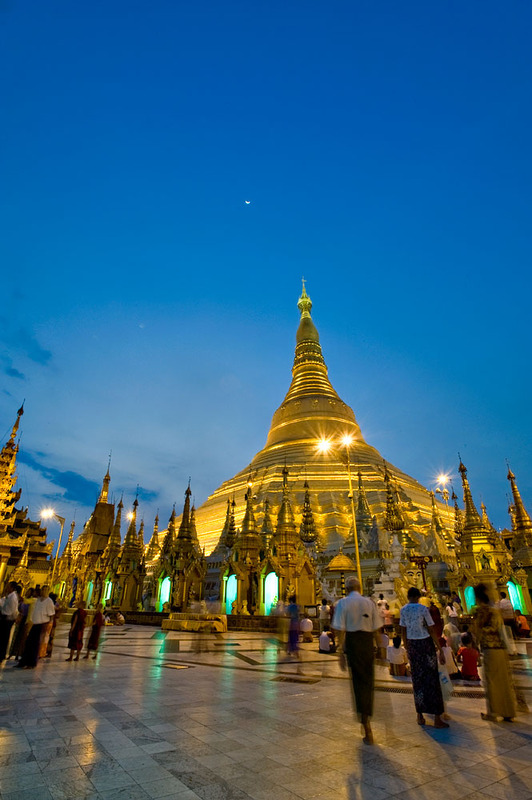 The best time to visit the Shwedagon Pagoda is undoubtedly in the early evening as the sun begins to fall over the city of Yangon. 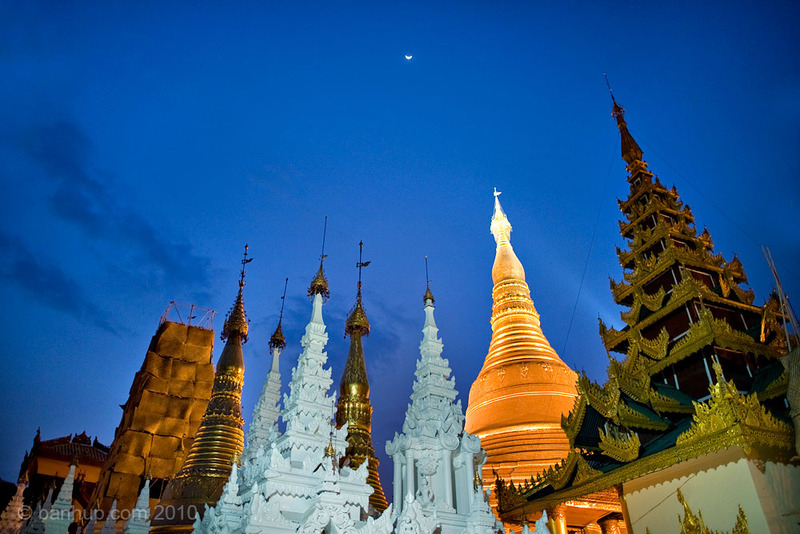 The historic Shwedagon pagoda towers almost 98 meters (326 feet) above the green cityscape of Yangon. 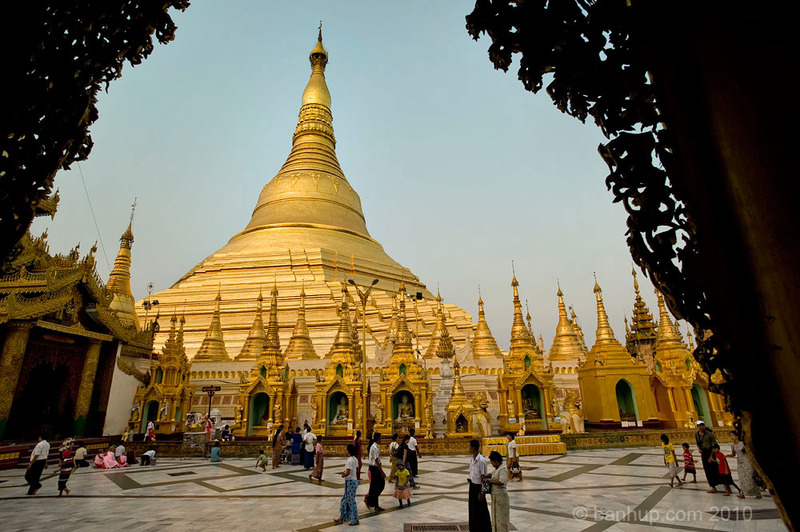 One of the wonders of the religious world, the Shwedagon Pagoda is believed to have been built more than 2500 years ago. 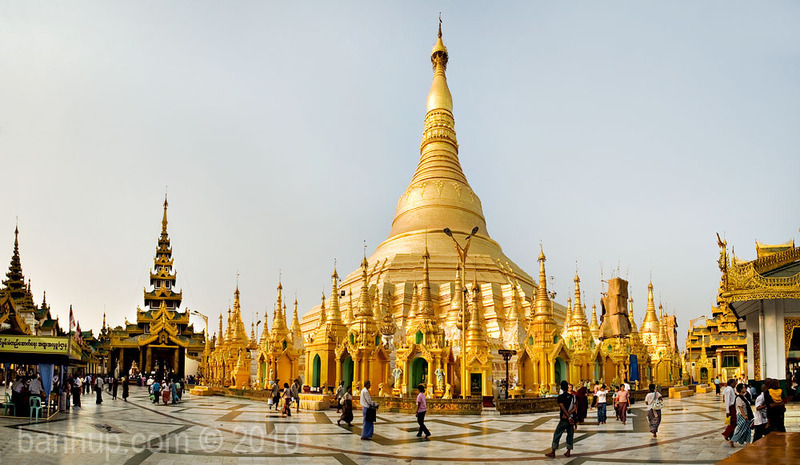 It is covered with hundreds of gold plates and the top of the Stupa is encrusted with 4531 diamonds the largest of which is a single 76 carat Diamond. Its compound is huge. There are four entrances – north, east, south and west, some with an elevator for easier access, as the entire temple grounds are raised high above the street level. 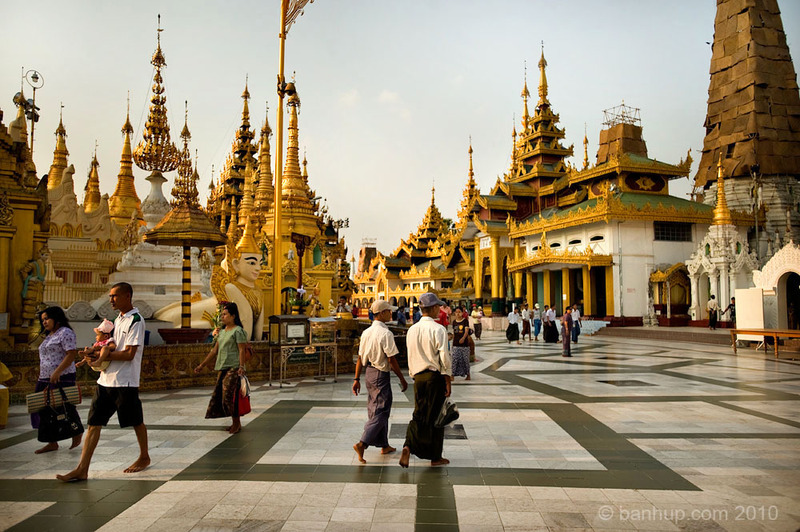 Otherwise, the steps are long and surrounded by small handicrafts and Buddhist offering stalls, as well as wooden carvings of scenes from the Bodhisattva. Surrounding the stupa are a mind-boggling number of smaller stupa, statues, shrines and pavilions, some sufficiently large to merit visiting in their own right. Located at strategic points around the stupa are the figures of animals that are associated with the day of the week on which one is born, to which one is supposed to pay respects. 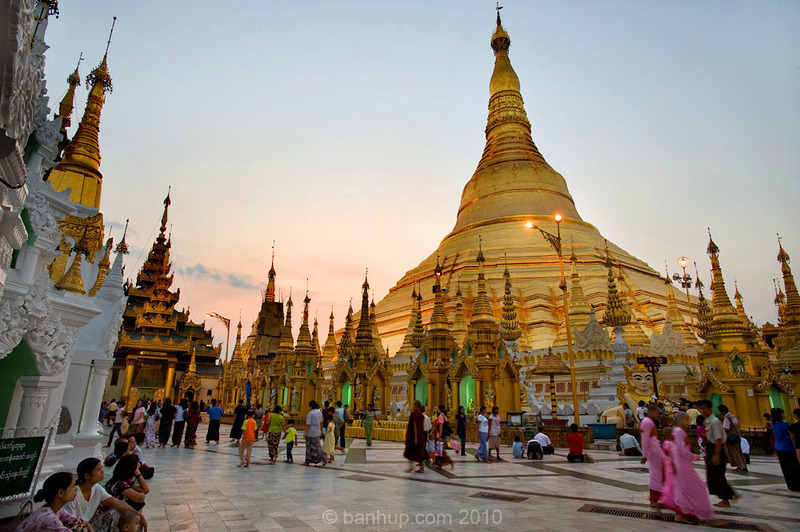 As in many places in Myanmar, there is an entrance fee - one for locals and another for foreigners. No shoes are allowed within the grounds. 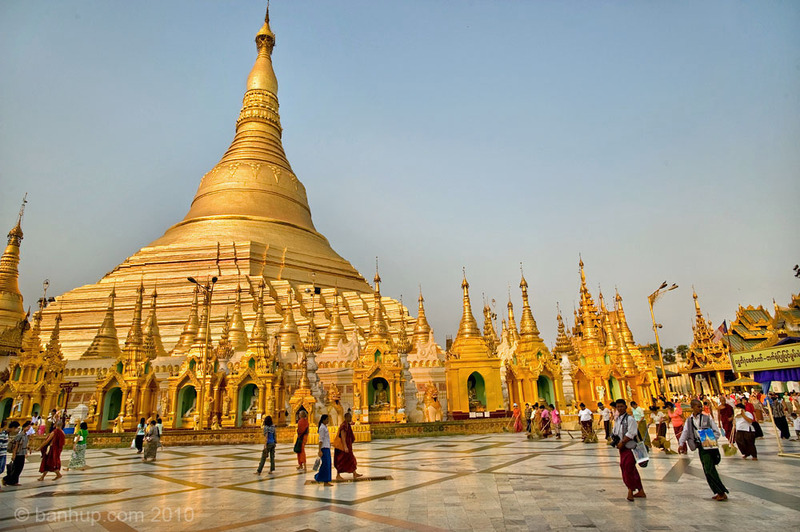 The golden pagoda. Notice the 'professional' photographers plying their trade here on right foreground. 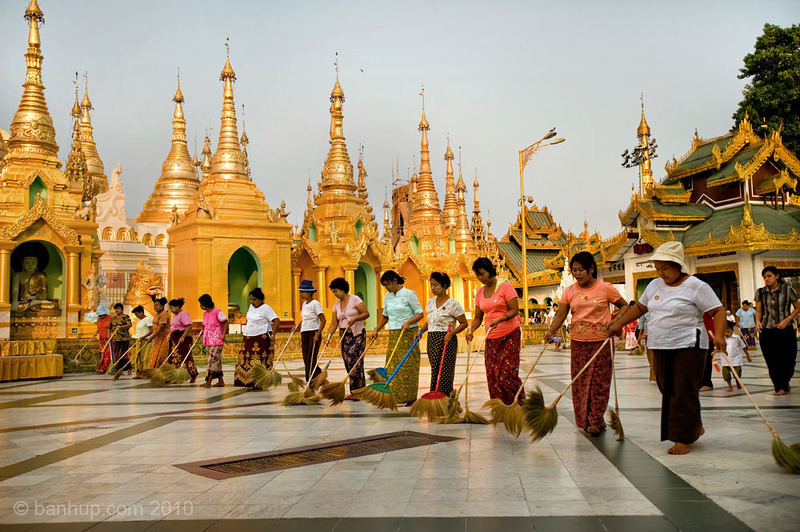 Right behind them is a team of volunteers sweeping the temple grounds. Close up of the sweeping volunteers. There was a few waves of this. A panorama of the temple grounds. I would have liked to stay back until most if not all visitors had left the grounds but tiredness and dehydration from the energy-sapping heat got the better of me. I don't normally drink much alcohol back home but while in Myanmar I made it an exception as a really cold Myanmar beer was too tempting for me to resist. It must have been the heat. We had that back at the hotel after a cold shower together with a surprisingly delicious dinner. Before I end Day 1, I was made to understand prior to the trip that internet connections was non-existent in Myanmar. That information is wrong as it was available at all our hotels for a fee ranging from free Wi-fi to US$6 oer hour. Facebook was easily accessible but Yahoo mail and/or MSN messenger was only available in certain places.